Handling of footnotes isn't actually defined by the EPUB 3 spec; what you're running into is an Apple implementation limit. This isn't a new problem, though. There are a number of reports of it if you search the web a bit. I can't offer any new advice. Matt, you say,"Handling of footnotes isn't actually defined by the EPUB 3 spec." So, why is that? Will this always be the case or are there plans to take this up? 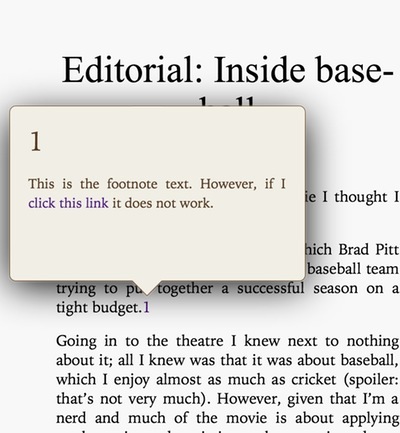 Obviously, IDPF recognizes the opportunity to vastly improve the reading experience (see:http://www.idpf.org/accessibility/guidelines/content/xhtml/notes.php) with respect to footnotes, endnotes, etc. so many would expect IDPF to be energetically working on this. 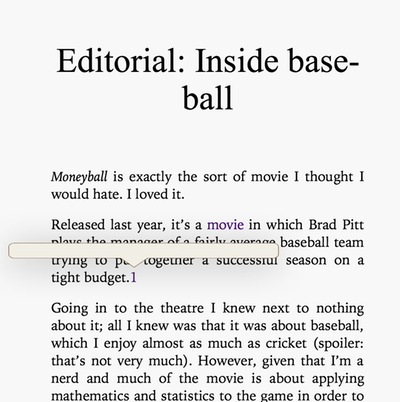 Other than apple, Calibre and some mobile epub viewers view popups.